4 MODES:spotlight,wider light,red always and red blinking.Simply push the button to switch the brightness modes. 4 PLACEMENT METHOD:hanging,absorbed on the iron or magnet,laid flat or hand-held. WATERPROOF:The light case is completely sealed,built-in waterproof ring. It is protected against splashing water from all angles. 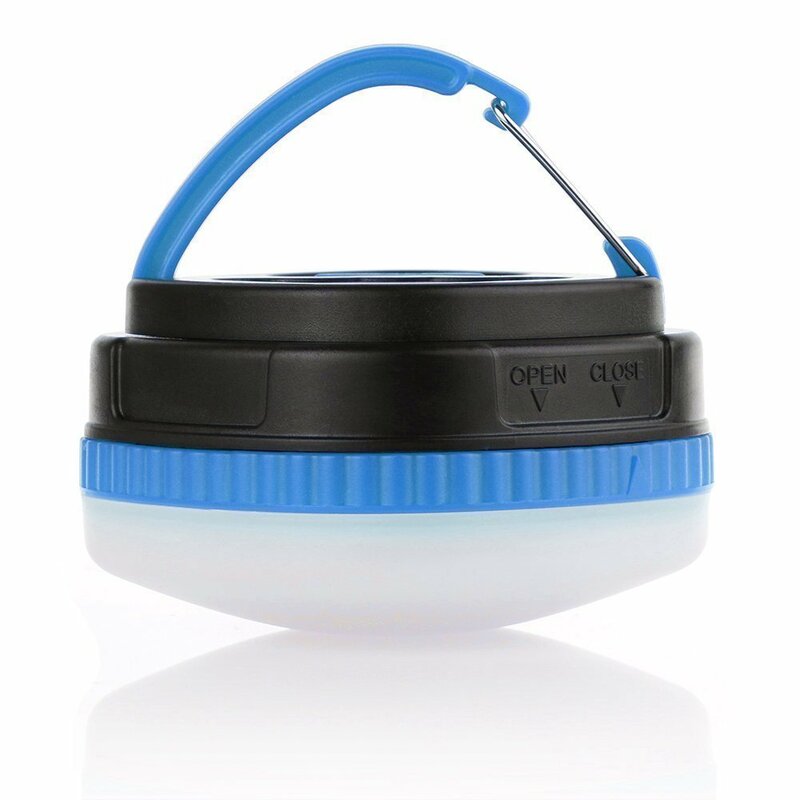 STURDY SURFACE:made of sturdy plastic with a magnetic base.Well made plastic come with lightweight design. SUPER DURABLE:Super long LED bulb life, up to 100,000 hours. Perfect to do anything with outdoor and indoors. Color: Blue Seller Warranty: 6 Months Replacement Warranty Tips - 6 Months Replacement Warranty only apply to purchased from Aukvi (Seller)AuKvi L8 LED Tent Light Lamp Small Camping Lamp Magnetic Lantern (Blue) is small but it makes up for it with all of the great features it has.It has four modes, high, low,red light,red light with strobe. The red strobe would be great if you need it in an emergency situation.The light is easy to turn on and off by just clicking the one button on the back.The overall construction of the lantern is well made plastic.There is a clip on the handle that you push to release so it can be attached wherever you choose. The clip springs back into place with ease. Very easy to attach and remove with one hand.You can hook it onto a string inside your tent or guide line above your hammock.Lightweight design made the lantern not even 4 ozs,can fit in a jacket pocket, nightstand drawer or just in the plam of the hand.This lantern built in magnet allows it to be be stick on any iron,or you can actually stick this one on magnetic surfaces.There is are several uses for this light such as hunting, hiking, camping, fishing, sailing, rescue, writing, reading at night etc.Attention:POWERED BY: 3xAAA (Not Included) The batteries are easily installed by screwing off the bottom and inserting them in to slots.